How Should Barack Obama Confront Racial Injustice? One of the most remarkable ironies to contend with is the fact that as we think about Professor [Henry Louis] Gates' [Jr., editor-in-chief of The Root] arrest, President Obama's intervention, the public reaction, and the broader issues of race, class, and crime, we find ourselves at a critical juncture in history. We must rejoice in the fact that Americans were able to put aside race and elect the person they thought was the most qualified individual to serve as president. This celebration echoed from California to Massachusetts, from Florida to Virginia, from North Carolina to Ohio. While this is an important sign of racial progress, it belies the fact that we are still a long way away from achieving Dr. King's dream of a society in which all people are judged by the content of their character, not by the color of their skin. If America can elect an African-American president, the thinking goes, how can we be accused of having a racially discriminatory society? The mistaken assumption is that since we have achieved so much racial progress, we should discontinue all the efforts to address racial discrimination in the 21st century. Those who believe that we are in a post-racial environment are naive at best or racially insensitive at worst. The Reverend Eugene Rivers, a feisty African-American minister in Boston, and one of the founders of the Ten Point Coalition, a group of black ministers who fought to reduce violence and crime among young offenders in Boston in the 1980s, has spent most of his professional life working with young black men involved in gangs and seeking to stem the violence in urban communities. In August 2009, Rivers participated in a public forum on Martha's Vineyard, hosted by the Charles Hamilton Houston Institute for Race and Justice and sponsored by the national law firm of Bingham McCutcheon, as a member of a panel entitled "Striking the Right Balance: Addressing Our Individual and Collective Responsibilities to Families and Communities." He said that he was worried by those who viewed the over-exuberant celebration of Obama's election as a manifestation of the arrival of a post-racial America. Rivers implored those assembled that day to not be too quick to assume Obama's election solves our race problem. While Rivers admitted the value of Obama's election, and that it was wonderful to behold the nation embracing Obama, he said that we should not be too eager to claim a victory over racism. Reverend Rivers also reminded us of how little progress we have really made: "There is one black man in the White House and a million black men in prison." The reverend's timely statement reminds us that we have much more work to do to overcome the barriers of class and race in our criminal justice system. While this book has identified instances in which conflicts between police and members of the African American community have led to strong feelings of bias, the range of complaints concerning racial bias in the criminal justice system today is much larger. At nearly every stage in the system, we find disparities in punishment, in the provision of adequate defense counsel, and in policies and laws, as well as other forms of bias experienced by African Americans. Marc Mauer, president of the criminal justice advocacy group The Sentencing Project, recently noted that, "in the most profound betrayal of the promise of integration and opportunity, the United States has created a world-record prison population fueled by policies that have exposed substantial portions of African Americans to the life-changing consequences of the criminal justice system." What Mauer describes as a continuing legacy of slavery places far too many African Americans in jeopardy. That legacy is seen in the increasing disparities in our society. Marian Wright Edelman, president of the Children's Defense Fund, notes in her new study on disparities involving children, "America's Cradle to Prison Pipeline," that disparities start early and continue throughout African Americans' lives. Edelman describes many instances in which children are pushed out of school, given no meaningful alternatives, and soon find themselves in the criminal justice system as adults. Furthermore, the criminal justice system compounds the problem by continually punishing race more than crime. One of the greatest ironies in the criminal justice system is the propensity of prosecutors to strike blacks from juries, not because of evidence of a potential juror's actual bias, but presumptions of racial bias. It is a practice that regrettably legitimizes perceived biases of prosecutors while presuming actual bias on the part of potential African American jurors. In several decisions the Supreme Court has chastised prosecutors for removing otherwise qualified African Americans from jury service because of their race. In Batson v. Kentucky, Justice Lewis Powell, writing for the majority, reversed a conviction of an African American defendant because the prosecutor had struck all of the potential black jurors. Prosecutors' use of peremptory challenges were also held unconstitutional in another Supreme Court case. In Miller-El v. Dretke Justice David Souter, writing for the majority, carefully scrutinized the entire record in the case and concluded that there were repeated instances of racial discrimination in striking African Americans as potential jurors. Following the lead of Justice Thurgood Marshall nearly two decades earlier in the Batson case, Justice Stephen Breyer, in a concurring opinion, suggested that the use of peremptory challenges should end. As federal district court Judge Reggie Walton has ominously stated, the disparate sentences received by African-American defendants in drug cases will cause other African Americans to doubt the legitimacies of the criminal justice system. "African-American defendants sentenced for cocaine offenses wind up serving prison terms that are greater than those served by other cocaine defendants. I have a concern that the disparate impact of crack sentencing on African-American communities shapes social attitudes. When large segments of the African-American population believe that our criminal justice system is in any way influenced by racial considerations, our [courts] are presented with serious practical problems. People come to doubt the legitimacy of the law-not just the law associated with crack-but all laws. People come to view the courts with suspicion, as institutions that mete out unequal justice, and the moral authority of not only the federal courts, but all courts, is diminished. I have experienced citizens refusing to serve on juries, and there are reports of juries refusing to convict defendants." As I recounted in From Lynch Mobs to the Killing State: Race and the Death Penalty in America, the problems of injustice in our criminal justice system are continuing and pervasive. It is ironic that the election of a black man, against the backdrop of pervasive racial disparity in the criminal justice system, can undermine our greatest goal: achieving a racially progressive society. Brown University professor Glenn Loury, who has written extensively on the topic of race and mass incarceration, has made clear that our focus on celebrating the president's election is misplaced if we fail to see the massive incarceration of African Americans as a failure of our democratic society to work effectively. Loury mourns the fact that our sense of democratic values is undermined by the acceptance of mass incarceration as a tolerable condition in an enlightened society. Loury observes plaintively: "Race helps to explain why the United States is exceptional among the democratic industrial societies in the severity and extent of its punitive policy and in the paucity of its social- welfare institutions." Loury is even more explicit in his condemnation of the growing problem of mass incarceration when viewed in light of the nation's enthusiastic election of Barack Obama. He bemoans the fact that while we can surely celebrate Obama's election, our values as a democratic society are misplaced. He goes further in taking President Obama to task for his support of Professor Gates, his friend, when the problem of black suffering in the criminal justice system goes unabated: "It is depressing in the extreme that the President, when it came time for him to extend political capital on the issue of race and the police, did so on behalf of his ‘friend' rather than stressing policy reforms that might keep poorly educated, infrequently employed, troubled but still human young black men in America out of prison." Loury was relentless in his criticism of the president for not addressing, in such a public and global forum, the embarrassing American problem of mass incarceration. Ultimately, the essence of his argument, and one shared by many, is to ask, What is the benefit of electing an African-American president if, when a teachable moment on the thorny issue of race arises, he does not use his enormous platform to give America a needed lecture on a criminal justice system suffering from the massive incarceration of African American men? Whether fair or not, Loury expected the president, if he is to use political capital on the issue of race, to use it where a systematic opportunity for change is apparent: "If Mr. Obama were going to lose some working-class white votes to the charge of ‘elitism,' I'd much rather it have been on countering the proliferation of ‘three strikes' laws, or ratcheting down the federal penalties for low-level drug trafficking, or inveighing against the racial disproportion in the administration of the death penalty." …The issue is not whether President Obama addressed the problem of racial profiling. He did and was quite clear. But the question of whether we can and should expect more from an African American president on the problem of racial profiling is worthy of further discussion. Charles Ogletree is the Jesse Climenko Professor of Law at Harvard Law School. 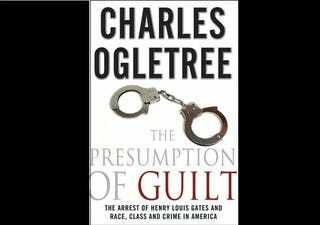 The Presumption of Guilt, The Arrest of Henry Louis Gates Jr. and Race, Class and Crime in America, was published on June 18 by Palgrave MacMillan.